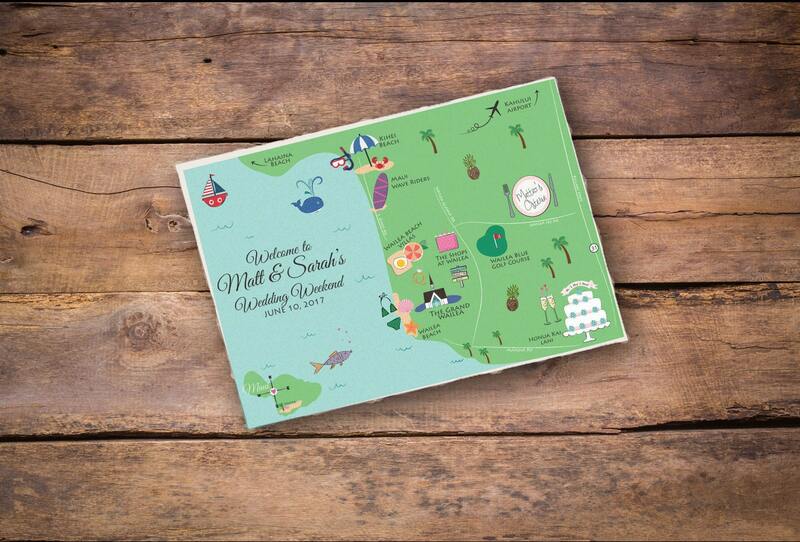 Our maps are fun, unique and functional and an excellent solution for communicating with your guests. For those unfamiliar with the wedding location, this visual element is perfect for helping your guests be aware of not only WHAT is happening, but also WHERE it is happening. 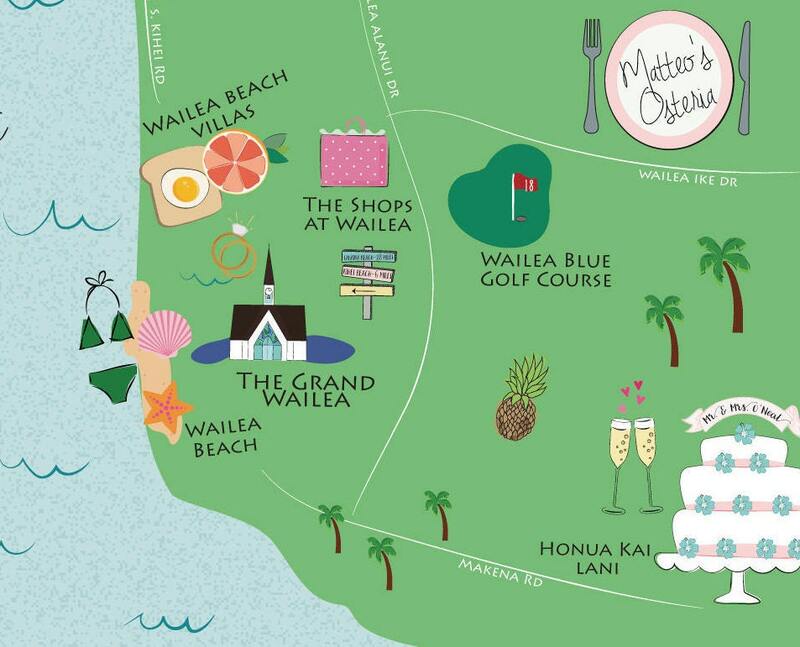 Our maps help guests to "see" the distance between the different event locations, allowing them to effectively plan their transportation and the amount of time needed to travel to each event. In addition, our maps are great to tell your guests about different ways to spend their down time and enjoy the area. We invite you to use this one of a kind tool to engage your guests and set the scene for the most important day of your life. Let our maps draw your guests in and get them excited about the adventures that await. 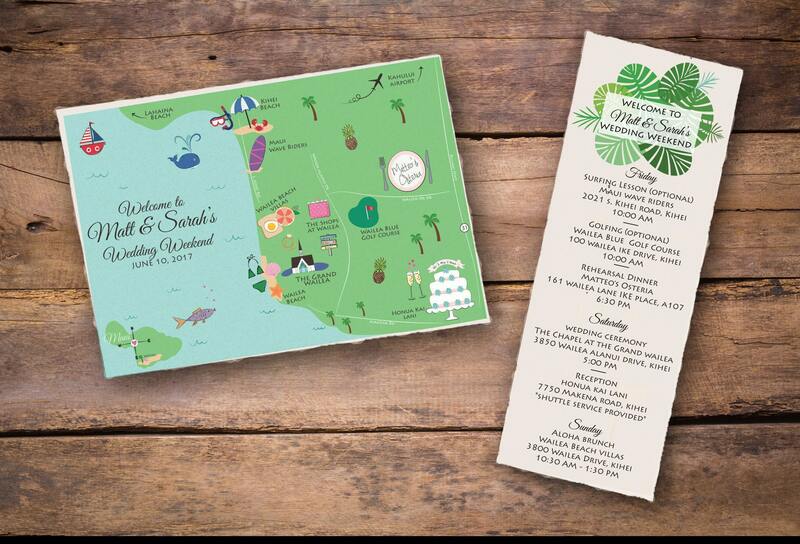 * Custom design with your location, wording, colors and illustrations that reflect the most important areas surrounding the venue (ie. landmarks, popular restaurants, local hotspots, boutiques and unique adventures off the beaten path). 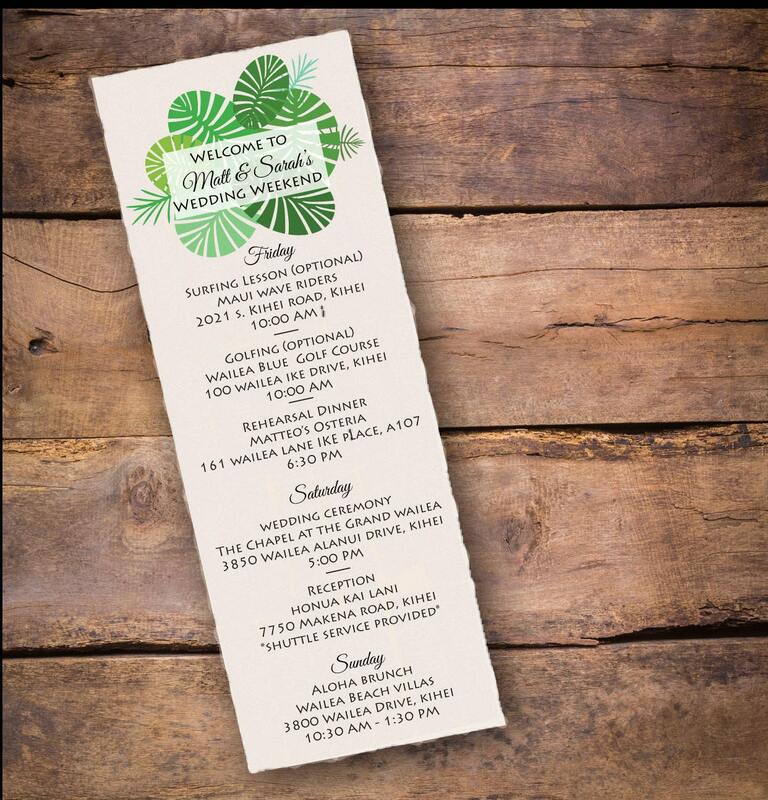 * Perfect as a "Save the Date", a part of the invitation, or a memento for your guest bags. * Use the design as your "guest book" at a special event. 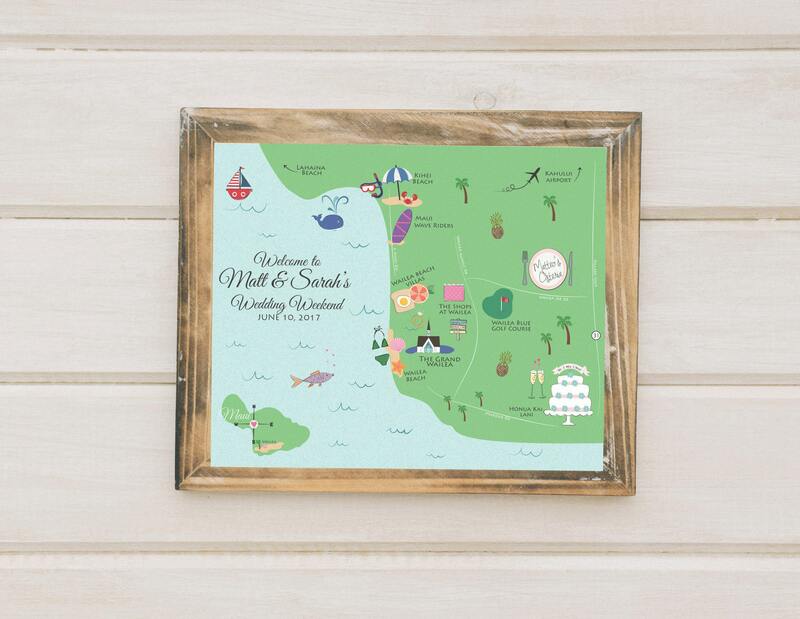 Simply matte the print and have guests sign the matting. Frame it, hang it, and use it as a fun reminder of the special occasion. * Add a schedule of events, for an additional fee, as a seperate item or to the back side of the map to keep guests informed of event times. *We offer a variety of products at different prices depending on the number of landmarks. If what you are looking for is not listed, please message us for a quote. 1. Please convo us about your project. Please reference the sample item (in the shop) that you would like to order. Once we receive your email, we will create a unique listing for your design, and notify you of the listing. 2. Upon receiving your order and payment, we will email you an electronic "questionnaire" to learn more about your wedding/party and the location. 3. We will contact you to discuss the details of the project and answer any questions. 4. Within 2 weeks, we will provide you with a digital proof and allow for 2 revisions to tweak the design. More revisions may be made for an additional fee of $25.00 per revision. 5. The final product, in the form of a high resolution digital file, will be emailed. Printing and shipping is available for an additional fee. Please message us for a quote. *Our maps are an artistic portrayal of the various locations and are not intended to be an exact replica or drawn to scale. *Please do not hesitate to contact us with any questions or send us an email to info [!at] polkadachs.com. Will the colors on my printed design look EXACTLY as they look in the digital proof that I view on my monitor? The digital file you receive should be a high quality rendering of your final proof. However, please keep in mind that we cannot guarantee every computer monitor will accurately depict the actual color of the merchandise. Please print a hard copy of the design to ensure that the colors meet your expectations. Will my finished product contain illustrations that are identical to the picture I emailed to you or the images you discovered while researching my project? We work hard to ensure that the our images are representative of our client's request. We do ask that our clients remember these renderings and illustrations are our artistic impression of the item and cannot be regarded as an exact representation of the request. We ask that our customers play close attention to the digital proof to verify that they are pleased with the design. We strive to provide our customers with a digital proof within 2 to 3 weeks. After this, we allow for 2 revisions (and more at an added cost) which we will apply within 48 hours. However, we do ask that clients discuss their timeline with us in advance to ensure that we can get the finished product to you at the appropriate time. Things can get a little crazy during wedding season and we want to make sure that we have everything to you in time for the big day! Expedited shipping is available, but please message us first for a quote. Due to the nature of our products, we do not give refunds after the final revision has been made. PolkaDachsis not responsible for any errors after proofs have been approved. We ask that clients pay very close attention. We are diligent about communicating with our clients during the design process to ensure that they are satisfied with the final product. PolkaDachs reserves the rights to all files and designs. 1. Please convo us about your project. Please reference the sample item (in the shop) that you are interested in. We will create a custom listing for your design. 2. Upon receiving your order and payment, we will email you an electronic "questionnaire" to learn more about your "story". 3. We will contact you (via email or phone) to discuss the details of the project and answer any questions. 4. In 2 to 3 weeks, depending on the number of orders in progress, we will provide you with a digital proof and allow for 2 small revisions to tweak the design. More revisions can be made for an additional fee. 5. The final product (digital file or printed copies) will be emailed or shipped priority mail.